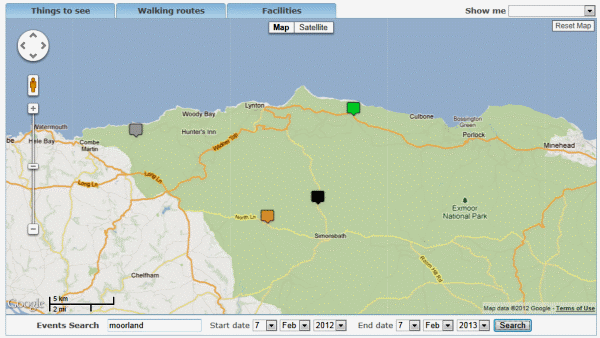 This is a fantastic tool for all our visitors to Exmoor! How brilliant! Now you can search a map of Exmoor National Park for all the local events. With so many things to do, it’s definitely worth a look at the Exmoor Visitor map before you set off, or when you book your accomodation. Look at the bottom of the interactive map – here is where you type in keywords (like… ‘red deer’) and choose a range of dates that you’re most interested in. Click the Search button. A list of events will appear and their locations pop up on the Exmoor map. Simply choose a location or whatever you like from the list! Click on ‘reset map’ or ‘clear search’ to start again.